I have another pair of scissors but I don't want to be boring so I'll stop with the tape for now. The last mani only lasted 2 days because I skipped a base coat and chipped something fierce, that'll teach me! I like that very much! A different twist on a French Nail look. it's like ocean waves! I loove it! I'm loving this idea girl!! What a great idea so very clever! Please do show us the other design you have - I for one am interested in seeing it. 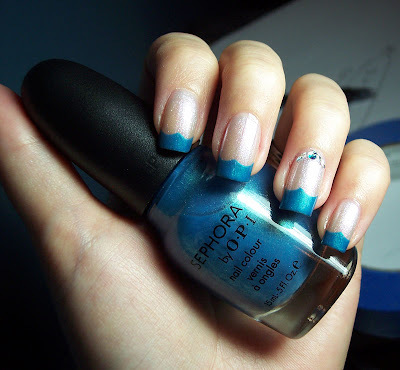 Lacquer Laine, thanks I thought it looked like waves too almost painted a boat, seagulls and a periscope lol. Brooke, thank you. The design possibilities seem endless with just 1 pair of scissors if you get creative. I was going to do a Hello Kitty theme later this week so maybe I'll try a scissors tut this weekend! What a great idea! Thanks for sharing. I have a ton of those scissors. This is so pretty gives it such a nice flow. Createitcottage, thanks I hope you try some! This might be the stupidest question ever, but what does painter's tape look like? Painter's tape comes on a roll like masking tape, but it's blue. At least all the ones I have seen are.